Anyone out there have a spare starter block off plate for a C-85-12? I need one. I have one. I do not think I will be needing it as I recently put a Sky Tec starter on. I will go out to the shop in a while and look for it. I will get back to you. I would be happy to send it to you. The regular folks on this site seem to really help each other all the time. A rarity in this day and age, I personally find it very refreshing. Oh and did I mention free. If Del is going to give it to you for free, how about giving him a NAA membership for a year or so in return? That way it helps everyone and as well helps keep the forum going! PS thanks Del, helps to have people on the board like this! DELCOM, I sent you a pm. Joe, I'll be happy to take care of the membership for DELCOM. Where do I send a check, and for how much? Top of every page on the bulletin board. No idea on the cost, (but its not much) I just take care of the bulletin board! I just take care of the bulletin board! Like babysitting us is a 15 minute job..........you are the reason this board is alive and growing. We don't have a lot of posters but, we sure do have lots of lookers. Mike: The plate is on the way. Thanks for the comments. We usually have 3-5 people who are registered on the board, but have had as many as 50 others looking around at one time. Most we ever had on the board at one time was 71 people. We are just glad to help and glad that we can keep the old airplanes in the air! I think back to the days when I restored my first Aeronca and it was a lot different having to call or US Mail someone to get a question answered. I received the starter block off plate from DELCOM a few days ago. There was a delay in my response due to Gail's Mom passing away. It is mostly back to normal now, and I sure want to thank DELCOM, and the folks on this forum for their help in optaining this part. I am humbled by your generosity. Is this a great forum, or what? I have sent DELCOM a PM. I'll be glad to take care of his membership in the NAA, but I don't think I can join for him due to not knowing all his details. We will work that part out. Thanks so much. 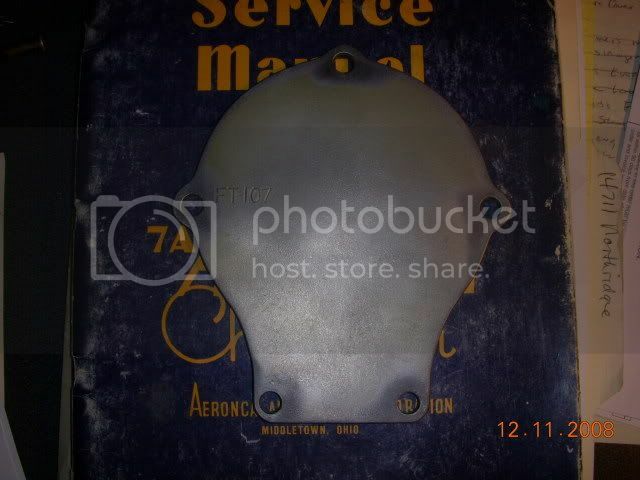 Now that I have the starter block off plate, I need a gasket for the same. Aircraft Spruce apparently don't carry it, or at least don't show it in their catalog. Who does sell Continental gaskets??? Any good engine shop will have these. They are all pretty much the same or you can make a gasket. There is no oil pressure on this area, just spray and drip. Yeah, I could make a gasket, but it would be nice if I had the correct gasket, I'd feel better about the seal with a correct one. I hate oil leaks, and this location did leak when we had the old C-85 in Gail's Champ. Who is a "good" engine shop? El Reno, Superior, Preferred is a good start. Any good engine place should have them. Even someone like Don's Dream Machines or a local aircraft parts house. Another spot I've had good luck getting individual parts is Bolduc Aviation in Minneapolis, Minn. Phone number is: (763) 780-1185. Ask for Darrell or Tim. I'm guessing Don Sword should have it though, and that's probably a lot closer for you. "If God had intended man to fly He would have given us more money"